Could it be that we've found out who the main villain in the upcoming Wolverine 3 is? Well, if you listened to the commentary on the X-Men: Apocalypse Blu Ray or DVD, you've probably heard from Bryan Singer that it will be Nathaniel Essex, better known as Mister Sinister. Director James Mangold recently put a little twist to this story when he tweeted out that he has never heard of the "Sinister guy", so will he be featured in the movie, or won't he? Either way, this comic has seen some attention since the release of X-Men: Apocalypse, merely out speculation, because of an appearance of someone that looked like he could been this Sinister character in the end credits scene. So, for Mr. Mangold's sake, I guess I should tell you a little about this Sinister fella, and his first appearance in this issue. When were first introduced to Mister Sinister, we see that he has enlisted the Marauders to carry out one of his missions. This mission is to make Madelyne Pryor disappear. It's not known why he wants her gone, since it's never disclosed in this issue. The Marauders end up kidnapping Pryor from her hospital bed, but soon go face to face with the X-Men. In a later issues, we learn that Mister Sinister wanted to get rid of Madelyne was because she was starting to get her memories back. You see, Mister Sinister created Madelyne Pryor. She is a clone of Jean Grey. 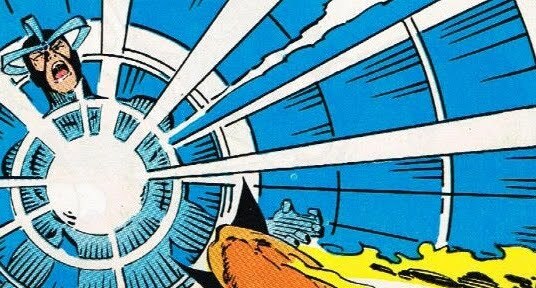 He created the clone because he figured out that if Jean Grey and Scott Summers (Cyclops) were to have a child, that he/she would be one of the most powerful mutants, powerful enough to take down Apocalypse. But since Jean was under the influence of the Phoenix Force and very unstable at the time, he created Madelyne Pryor for the purpose. Nathaniel Essex was a brilliant biologist in the mid 1800's. He theorized that the combining of genes from certain individuals would result in the mutation of the offspring over time and create superior beings, like Jean Grey and Scott Summers would. Essex was considered on of the greatest scientific minds of his time by some, and dangerous by others. He was eventually given is powers and immortality by the first mutant, Apocalypse, and took up the name Sinister. Finding print run numbers for comics that came out at this time isn't an easy thing to do. I couldn't find any information while doing my research for this comic, but I'm sure they are not in short supply. 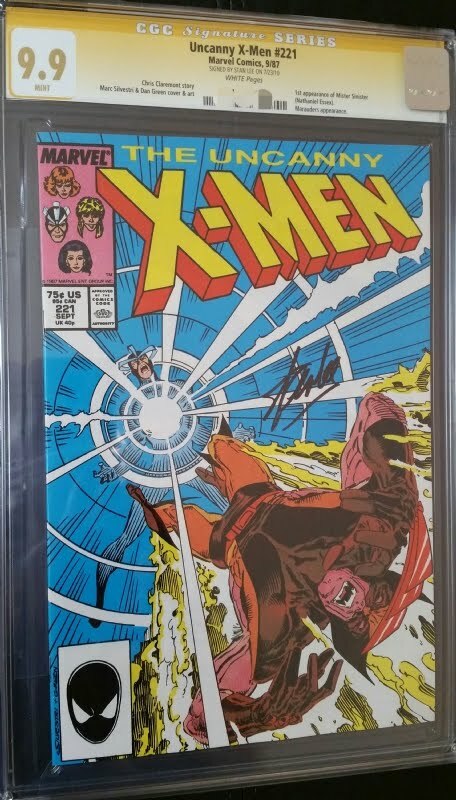 Doing a quick search on eBay or other online comic shops turns up many results, a lot of them ungraded. 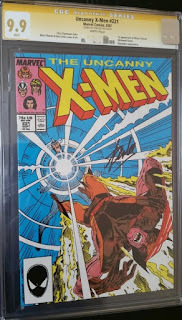 As for graded copies, there have been 1,405 copies graded by CGC thus far. It's no surprise to me that most of these copies are in very high grade. Of those graded, 1,128 are graded a 9.4 NM or higher. Most of the copies are a very high 9.8 NM/M (595 copies) while three of them are graded at a highest 9.9 Mint. 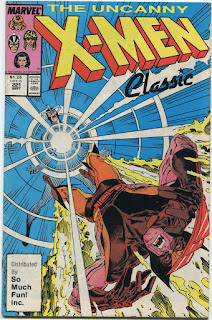 This comic has seen a lot of action in the market lately, especially on Sept. 12th, when the news about Mister Sinister's appearance in the Wolverine movie hit the web. It looks like everyone started scooping up all of the high grade copies on eBay they could find. There were 21 sales of this comic on that day alone. Since there are so many copies of 9.8 NM/M out there, let's take a look and see how they've performed. When we go back to early 2011, this was pretty much considered a bargain bin comic. You could snag an already graded copy for around $40-$50. Values shot up to the mid $100 range a couple years later in 2013 and hovered there for quite a while. Then, in about May of this year, it shot once up again to around $250-$300 range, probably because of speculation that it was Mister Sinister that was in the end scene of X-Men: Apocalypse. Now all of the sales that happened on Sept. 12 range between $175 up to $249.95, and that's where they have been since then. There have been a few sales of 9.9 Mint copies too. Back in 2009, a copy sold at Heritage Auctions for only $418.25. Fast forward to 2014 and we see a copy dropping for $750 on . Not a bad increase and still somewhat affordable for a comic in that grade. It will be interesting to see what a copy would go for now. 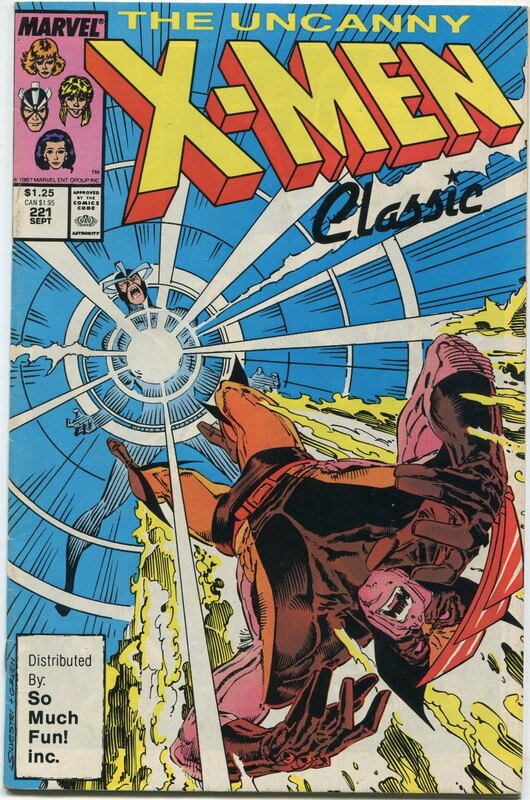 We have a "So Much Fun" copy of Uncanny X-Men #221 out there for all of you variant and rare comic hunters out there. These copies are easy to spot from the original cover. If you look, you will see under the title is the word "Classic" and in the UPC box, it reads "Distributed by: So Much Fun! Inc." I've included a picture for reference. I have no idea who So Much Fun! Inc. is. I couldn't find any information at all on them. However, it's estimated that the print run on this variant is about 5,000 copies. There are only 19 of them listed in the CGC census so far. The fine folks over at CGC recognize it as a second print, but they do make note of the So Much Fun variant on their label. Don't expect this comic to be and easy find. As of this writing, I could only locate 4 copies available on eBay, Two graded and two ungraded. If you're looking to snag one of these hard to find variants, then click here . I'm not sure if this comic has reached a peak or not yet, or, if it hasn't, how much more potential that it has. I myself am weary about snagging a copy now, but if you feel that it has more room to grow as an investment, then you should go for it. If I were to snag a copy, I'd probably go with one of the variants, if I could get it for a decent price. As always, I leave the decision to you.